We got a new worker recently. A new machine to help us load and haul heavy logs. I’ve been a long time hater of equipment. It’s just more to take care of. But, one of my friends up in Ft. Worth, Jimmy Pritchard of Integrity Tree Care, has been telling me for a long time that it has revolutionized his business. So, I’ve decided to give it a try. The machine is pretty low cost compared to most equipment and it is small so we can take it into back yards and many other places that large equipment won’t go. We’ve only done one job with the mini so far, but it is definitely earning its keep. 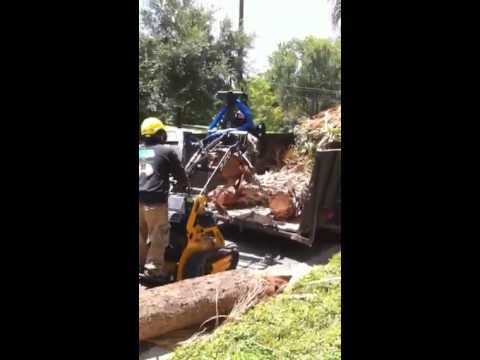 The logs in this video are from a palm tree. This wood is difficult to cut with chainsaws and the wood is very heavy. With the mini skid steer we didn’t have to cut into small pieces or pick them up at all! As you can tell, we’re going to have to get used to driving it, but this machine is going to save us a lot of back breaking labor!